My eventful commute to Vaidyagrama typically sees me at school around 9am. I have an hour to spend before class starts at 10am, and I usually do some of my morning chanting meditation then. I’ll get asked a few questions from patients as to what I’m doing and it gives me a chance to tell them about my beliefs and practices in ISKCON – but otherwise most people know what it’s about, bid me a good morning and get on with their work. 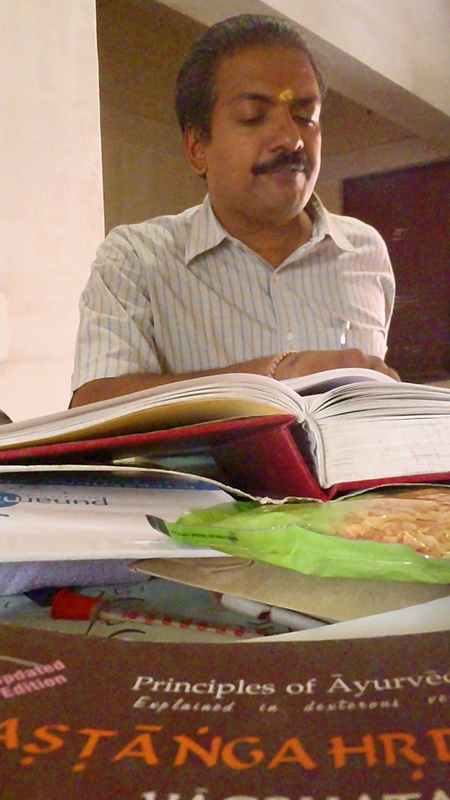 I walk over to my classroom at 10am and Dr Ramdas greets me, not with a ‘good morning’, but rather ‘a very good morning’, and his warm smile. 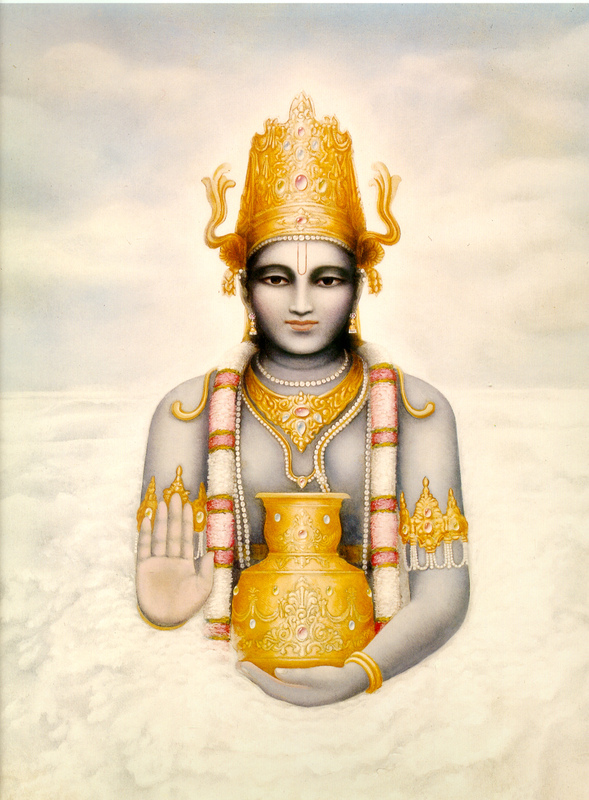 We begin our classes with mantras (sacred hymns) invoking Lord Ganesh to remove obstacles from our work, saluting Brahma, Vishnu and Shiva (responsible for creation, maintenance and destruction respectively), praying to Lord Dhanvantari (the god of medicine) and Goddess Saraswati (the goddess of knowledge). Dr Ramdas reads from the Ashtanga Hrdaya in Sanskrit, and then reads or translates the verses into English, and if appropriate gives some further explanation/understanding, or shares his experiences on the subject matter. Along the way, I tend to ask questions relating to what I’ve learnt in my nutrition degree and ask him to correlate this with the Ayurvedic concepts of nutrition. It really helps me when he explains this as I am able to connect what I’m learning now with what I’ve learnt before, and think about how to present Ayurveda to a Western audience. 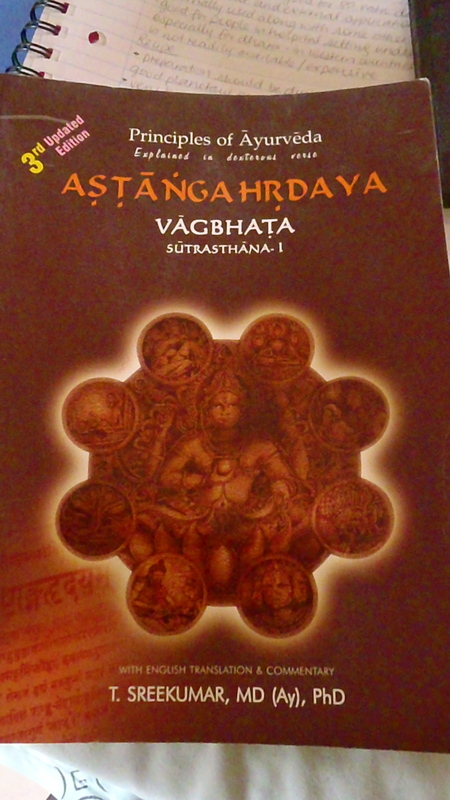 The Ashtanga Hrdaya we use. And this is just one example of a combination of three herbs – there are numerous other combinations told in the texts – all having special characteristics for certain disorders. Dr Ramdas will reel these off also. Besides knowing the Latin or botanical names, he will remember the names in English, Tamil, Malayalam and Hindi, and since you never stop learning, he will ask me if I know the name in Gujarati (my mother tongue). Plus, many of the plants will have synonyms in Sanskrit, representing the different qualities of the plants – Dr Ramdas knows these too! And on the days when we walk around the Vaidyagrama campus, Dr Ramdas will point out to different plants along the way, and say, “I hope you remember, the castor plant, eranda, Ricinus communis, or we talked about guduci, Tinospora cordifolia, one of five in the bitter herbal combination.” Usually I just nod my head, hiding a worried look and think, “No, I don’t remember”, and frantically write down everything again. 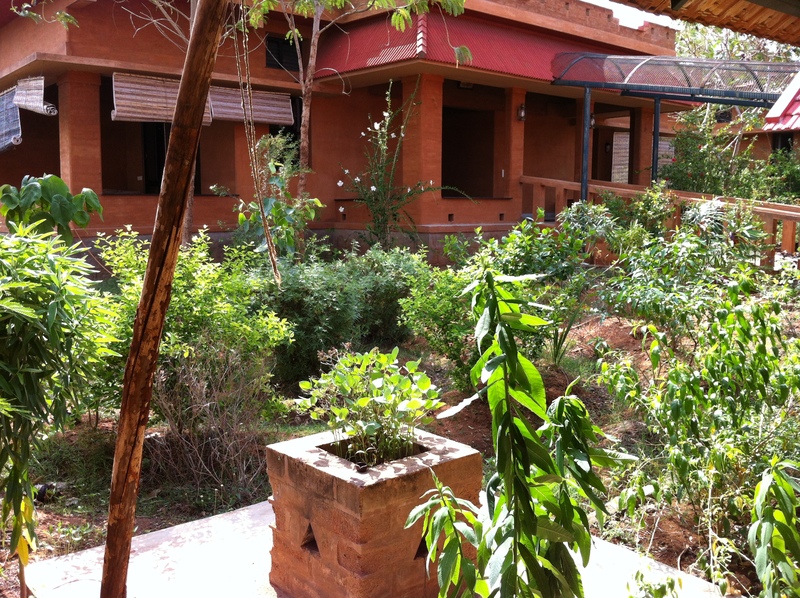 Some of the many plants in the Vaiydagrama garden – all of which Dr Ramdas knows! We have a three hour class in the morning, then a two hour lunch break. During the break, I have lunch, sometimes attend yoga nidra – which is meant to rest your mind only, but I call it the official afternoon siesta – and finish my chanting meditation or talk to some patients. At 3pm, we resume class and this continues until 5pm at which point I start on my journey home. My schedule is pretty flexible however, as for the second and third months of my study, I was the only student, so the classes felt more like discussions than formal lessons. Gaining a deeper understanding of Ayurveda and in such a traditional manner too, has made me greatly appreciate this ancient science and marvel at the ideas that were put forward thousands of years ago, and just how relevant and accurate they are still today. Happy to have read your experience! From what I hear of Dr.Ramdas’ Ayurvedic insight and medical acumen, you were in very good hands.